Just a quick note to say our blog has now moved to http://hernecottage.co.uk. This is to be able to offer you bigger and better things in the future, more how-to’s, recipes, recommendations etc. So do come over and see us in our new home and update all your links etc. We hope to see you soon! Hello one and all, I am back again to report on what’s been happening at Herne Cottage so far this year! We started on the veg garden later than usual due to work and other commitments, beginning with a tidy of old pots and pruning in the patio area, as well as some vigorous de-weeding! We brought in a few tomato and cucumber plug plants to get us started and these were potted up along with some pretty spring bulbs and aromatic herbs. This gave us back our lovely relaxing patio area that is just perfect for unwinding in with a glasss of wine after a hard day’s gardening, and of course eating al fresco when the weather is good! 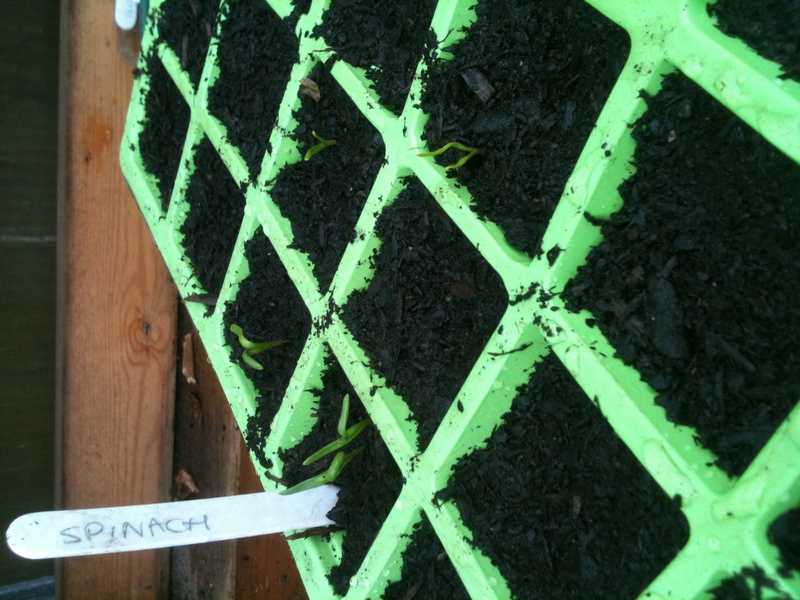 We then got on with catch up sowings of lettuce, spinach, chard and peas a few weeks ago, which have started to push through in their seed trays this weekend. There was a frost this week however, that caught us out after a good run of sunny spells, so the tomato plants have perished as they were left outside and we need to sow some more after all! With the longer days and warmer weather on the horizon, we should have some new plug plants in no time.. 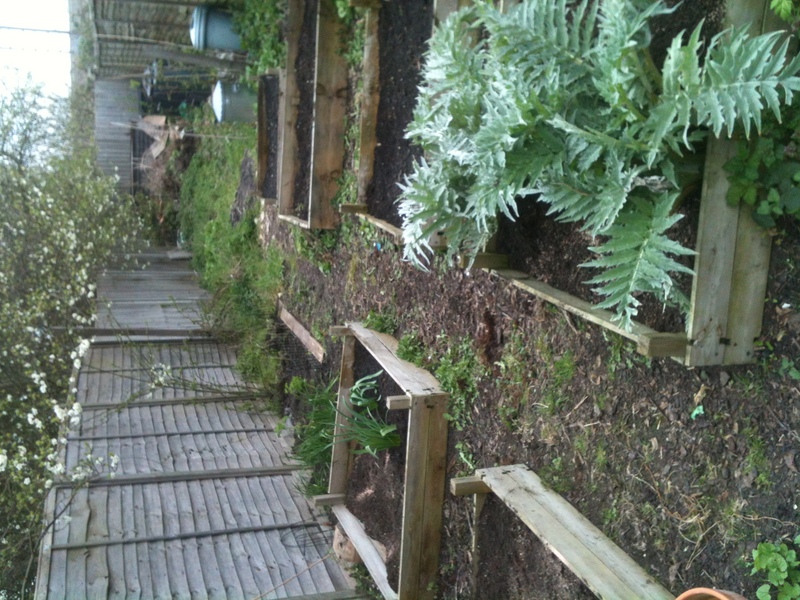 The next job to do this weekend was to clear the raised beds, again of old plants from last autumn as well as the weeds, and dig in some rich organic matter. 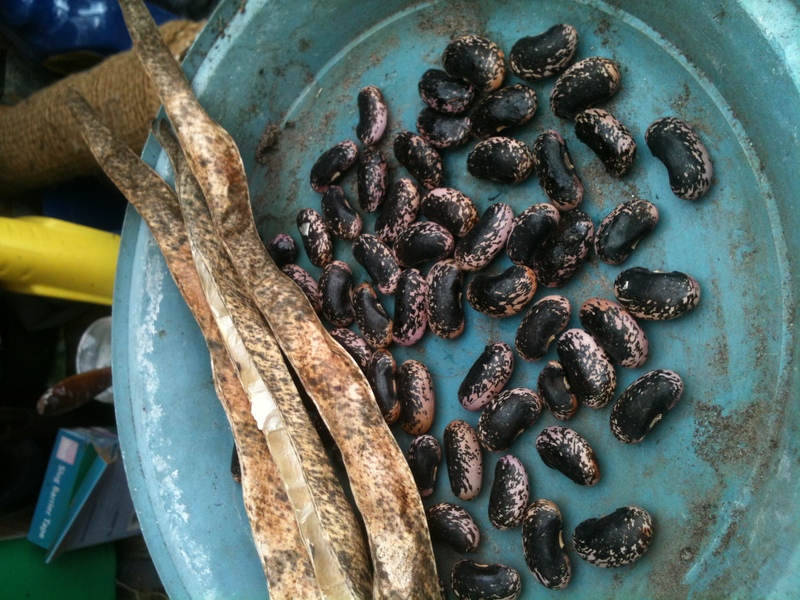 This helps prepare and improve the soil ready for planting out seedlings. 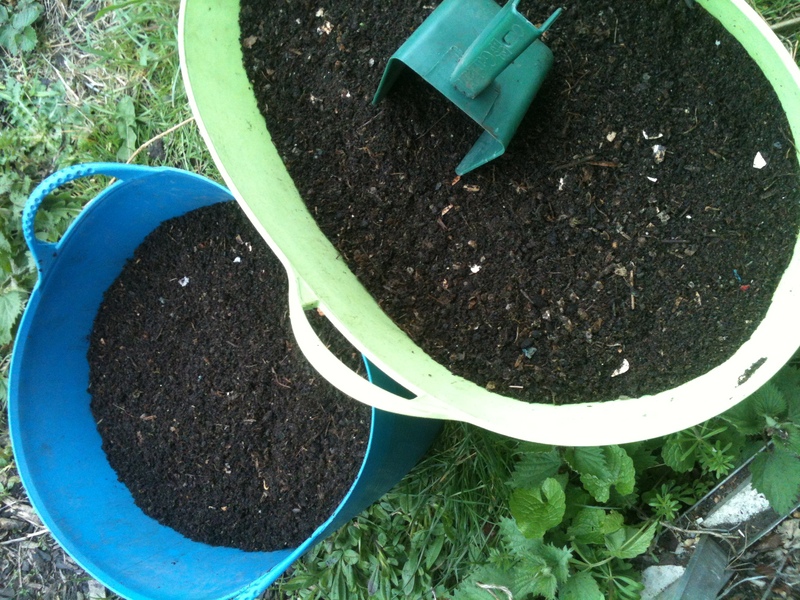 We added in some chicken manure pellets, as well as our own compost, freshly sieved from the bottom of the bins. This is a very satisfying task knowing you are putting something useful back into the earth from your own kitchen waste recycling and helping the next years crop of veg grow beautifully! 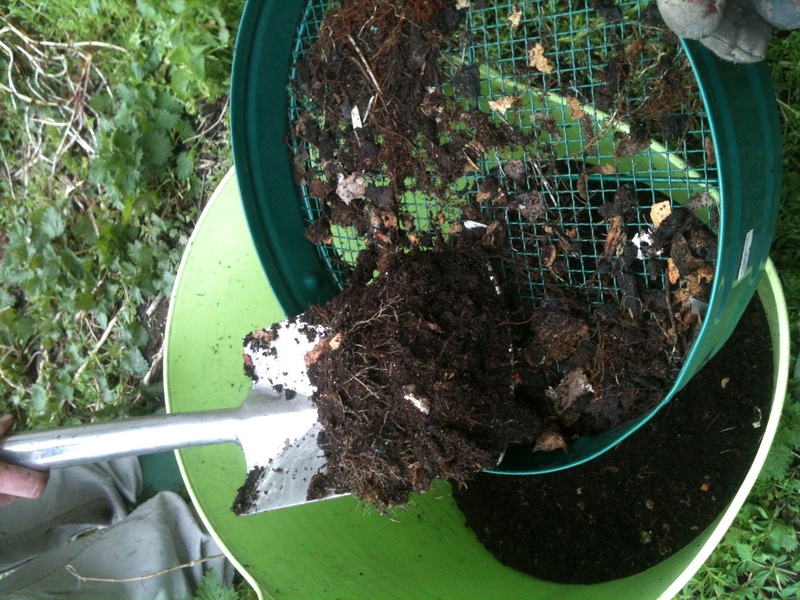 Home made compost is also great for seed sowing as has just the right consistency needed for the seedlings to push their roots through into. The first seedlings to then go directly into the ground were radish and lollo rosso lettuce in one bed, with beetroot and marigold flowers in another. I am hoping these pairings will look decorative next to each other when they are in full growth, making the kitchen garden look ornamental as well as functional. In the greenhouse were sown our replacement tomatoes, french beans, courgette and curly kale. This year we have also sown runner bean seedlings saved from last years pods, so that will be interesting to see how well they come up as well. This is a great way to save money instead of buying new seeds every year. If you can let some of your crop go to seed for this purpose it again is a recycling process of the whole garden, putting back into the earth some of what you take out. The redcurrant, blackcurrant, raspberries, blackberries and gooseberry plants have all now been pruned in our fruit garden, and the base of the plants de-weeded with a sprinkling potash feed to get them off to a good start. The gooseberries already have flowers on as well as the sloes so here’s hoping for another bumper fruit harvest this year. 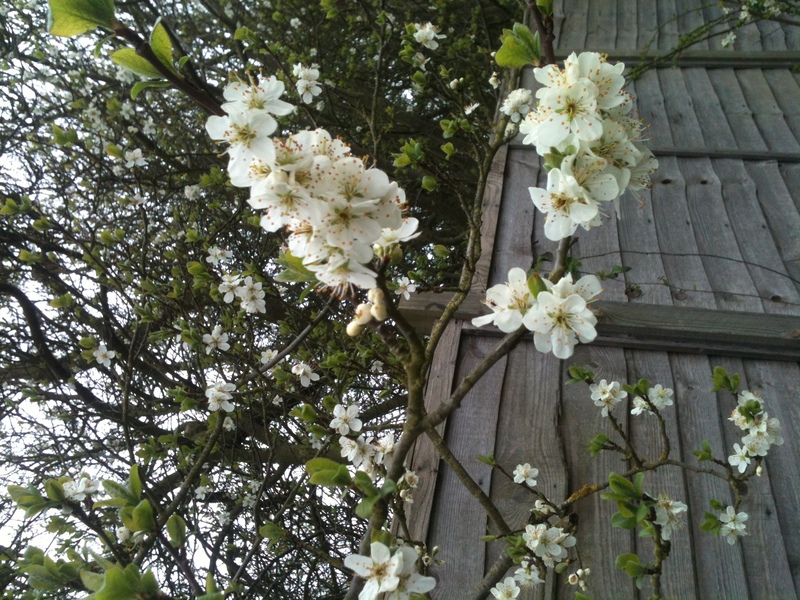 The neighbouring damson trees from the railway embankment are also nearly in full blossom (and very pretty) so we should have another crop of wild fruits ready to make into delicious damson gin again ready for Christmas! Lastly in the fruit garden, our rhubarb donation from mother in law last year has several healthy looking stems, so will have to find a delicious recipe to use that in over the next few weeks for when it is ready to harvest. I am hoping it is around the same time as the gooseberries as that will be a tasty (sharp tasting) pairing! Bye for now and happy gardening! Here is my recipe for lovely Pumpkin Soup. Perfect for Samhain/Halloween celebrations and the spices liven it up a bit to make it extra warming in front of a fire. If you have a few pumpkins from your vegetable patch, why not make a few batches and freeze to enjoy at Christmas too?! Chop the onions and garlic and sauté them in a large saucepan until beginning to turn clear. In the meantime peel and chop the pumpkin into 2 cm pieces. Add to the pan with the spices, mix with the onion and garlic flavours and soften for about 3-4 minutes. Add the vegetable stock and bring to the boil, then simmer for 20 minutes until the pumpkin is soft. Allow to cool, then blend until smooth. Pour into bowls, serving with crispy bacon or toasted pumpkin seeds, and swirled in cream. We’re Pagans at heart here at Herne Cottage and love to live as nature intended, enjoying the seasonal gifts they bring and aligning ourselves to the natural energy of the Wheel of The Year. 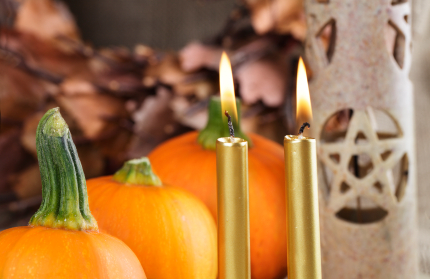 Our favourite celebration is Samhain (pronounced sowen) where we think about what must end, so that life can go on – just as in our garden where old plants make way for new ones next Spring.It is a time of letting go, and also a time to honor and remember our ancestors, both of our family and of the Earth. We remember we belong to them and it is they who gave us life. Death is part of nature’s cycle and we honor this, it must happen before we can return. We also celebrate new life at this time. In nature trees are willing to let go by dropping their leaves for new ones to form, and plants drop their seeds so they can go on long after they have returned to Earth. So Samhain is a seasonal celebration of endings for new beginnings. We celebrate by lighting fires, burning incense and cooking a feast. 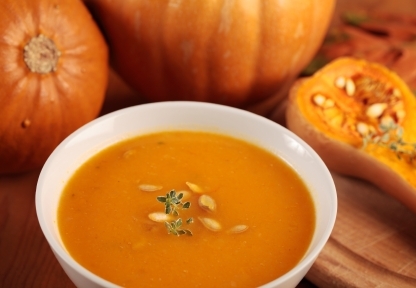 Today we are enjoying spicy pumpkin soup, to warm and soothe as the days get shorter and the weather turns colder. 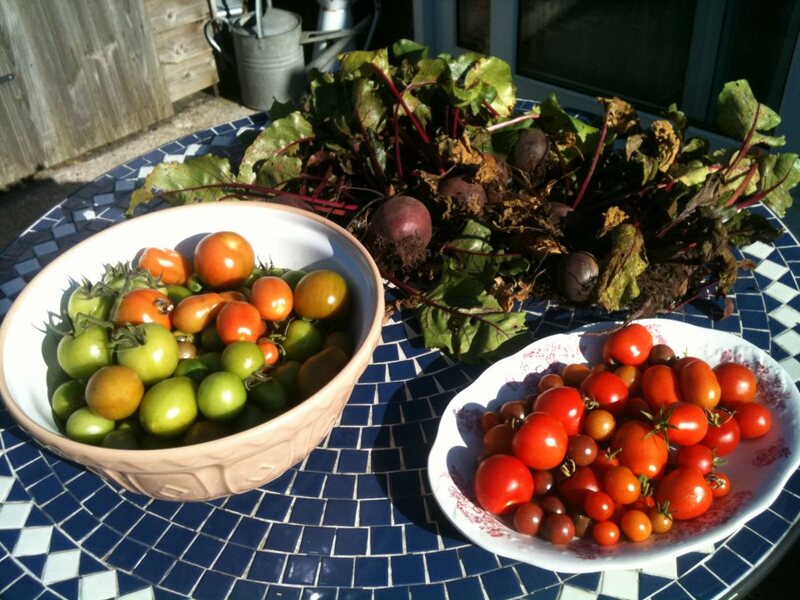 Did you have to get your tomatoes in this year before the frosts hit? Some were still green? 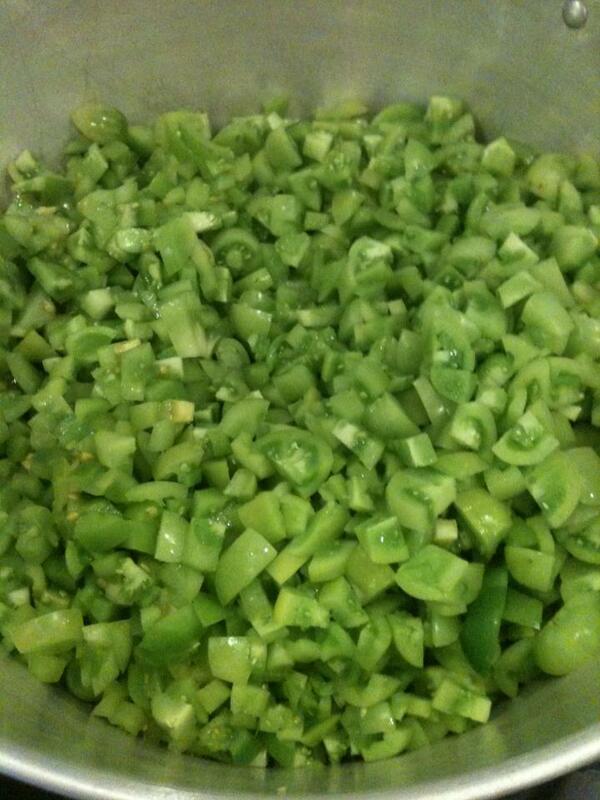 Well here is an idea of what to make them into, delicious spicy Green Tomato Chutney. This is the first year we’ve made this at Herne Cottage and should be just perfect in time for Christmas! Chop the tomatoes, peel and chop the apples and shallots and put into a large preserving pan. Chop or bruise the ginger and put in a muslin bag with the chillies (whole). Add all of the rest of the ingredients to the pan and bring to the boil, stirring until all the sugar is dissolved. Then simmer for about 3-4 hours until desired consistency is reached (about the same as a curry or stew). Remove the muslin bag and pour into warmed, sterilised jars. Cover and label. Green Tomatoes in Pan ready for Chutney! 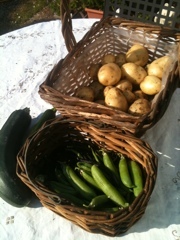 October was the month for the final harvest for us at Herne Cottage. 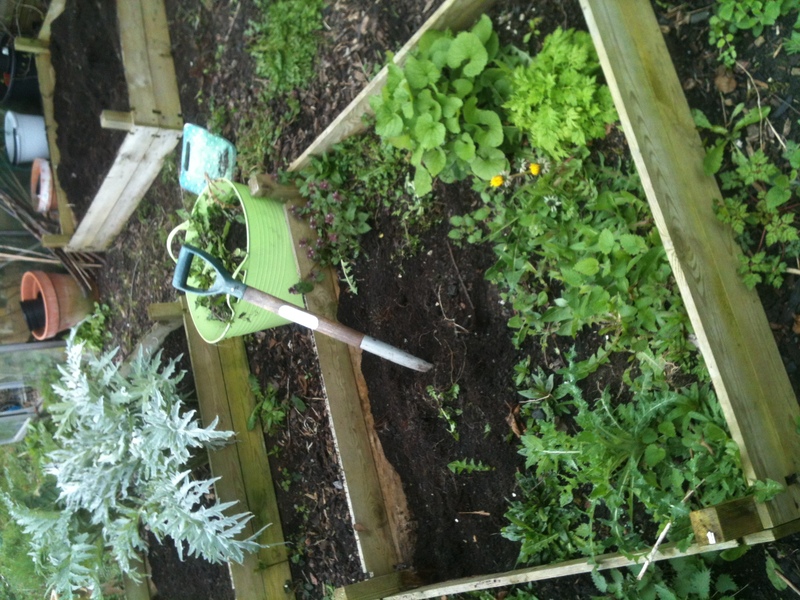 The last veggies left in our beds were tomatoes, beetroot, runner beans and chard. We’re hoping the Kale will keep going throughout winter – one year it even survived through snow! Just perfect for adding to winter broths with chestnuts and leftover Christmas ham. We decided to get all the tomatoes in before the frosts, which meant that some were still green. No problem however as they made a perfect Green Tomato Chutney! So all that’s left to do is a final tidy of spent plants for winter, then planning next years garden when the new seed catalogues fall on our mat just after Christmas! 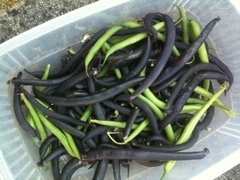 July was the month that the main harvest started and we’ve enjoyed plenty of peas, French green beans, courgettes, chard and lettuce to keep our kitchen larder stocked! 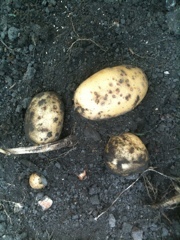 The second early potatoes were also ready towards the end of the month and we’ve been enjoying those especially with seasonal fish suppers. The veg beds need constant weeding and tidying this time of year also to allow the veg to have the best conditions to come through, along with lots of watering and feeding to allow their fruits to swell! We’ve also been pinching out out tomato plants to allow them to concentrate on swelling their fruit and feeding regularly also. 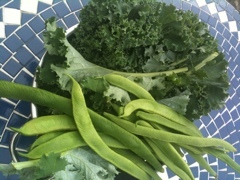 Towards the end of the month/early August the first kale and runner beans were ready to pick. The fruit garden has been abundant this year for us, helped by the combination of some warm sunny days to help ripen the fruit, but also rainy days to help swell it and make nice and juicy! We were still picking strawberries well into the month, along with blackcurrants, blueberries and raspberries. 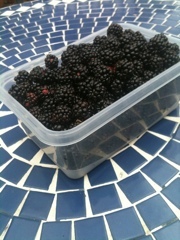 The blackberries are also early to ripen this year and we have picked a good 500g already! Now the only decision left is what to make with them? !